Every year during spring and summer I put myself on an apple fast. I don’t eat them anymore because all of a sudden I think they are the most boring fruit in the whole world. In spring there’s rhubarb that suddenly seems so much more interesting. And then summer starts and brings fantastic berries and amazing stone fruits. Also, apple aren’t in season during summer. There’s really no need to eat them. This year summer was long and I was still sweating in September. I bought a new jacket and haven’t used it so far. The berries disappeared though and made room for lots and lots of apple boxes with about ten to twelve different varieties. There were pears, too. 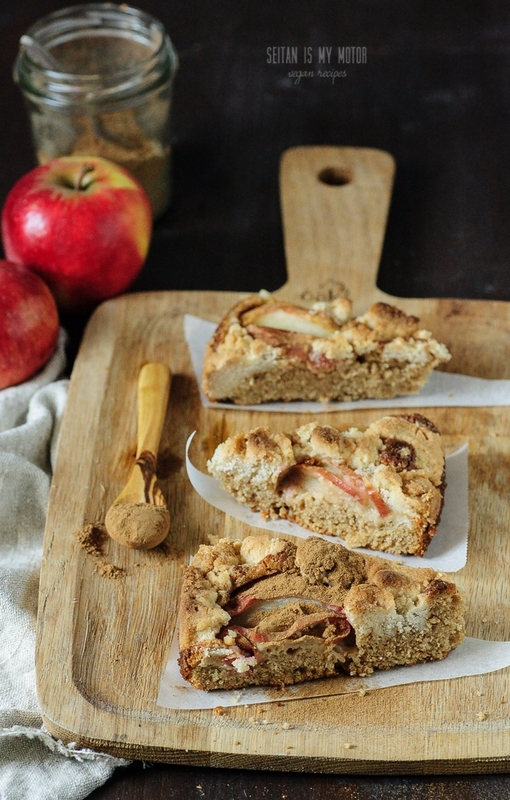 (I only mention this because this apple cake can be made with pears as well.) Right now my favourite apple is called Santana. It’s originally from the Netherlands and a cross between one of my favourites, Elstar, and some fairy tale apple called Priscilla, with which Santana probably shares its beautiful bright red colour. Santanas are juicy and firm and have a perfect balance between sweet and sour, leaning a tiny bit more to the sour side. Which makes the perfect baking apples. 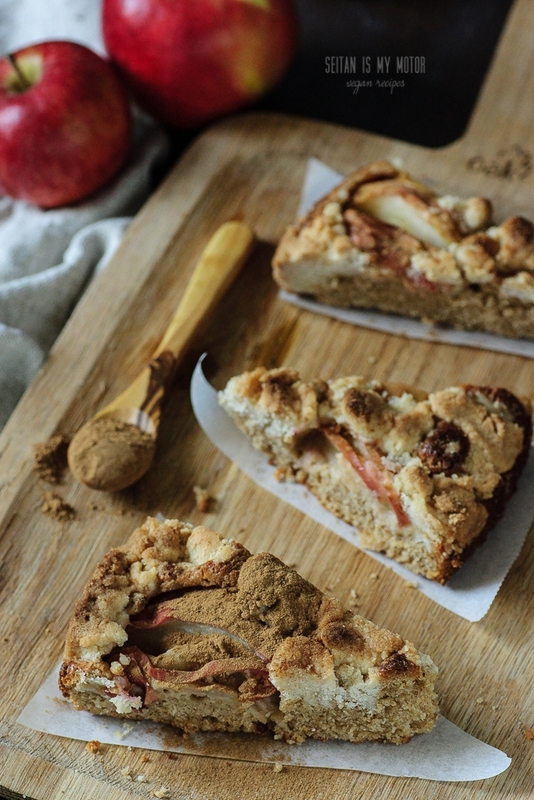 This is a simple apple cake recipe which may not look like much. I whipped it up on Friday before heading to work. I didn’t even use a proper recipe. I left it on the kitchen table and when I went on my break about three and a half hours later the cake was gone. Those coworkers just left some crumbs for me. But instead of complaining I’ll take that as a compliment for this cake. I made another one on Saturday and this time I managed to write down the recipe. Which was a bit tricky. 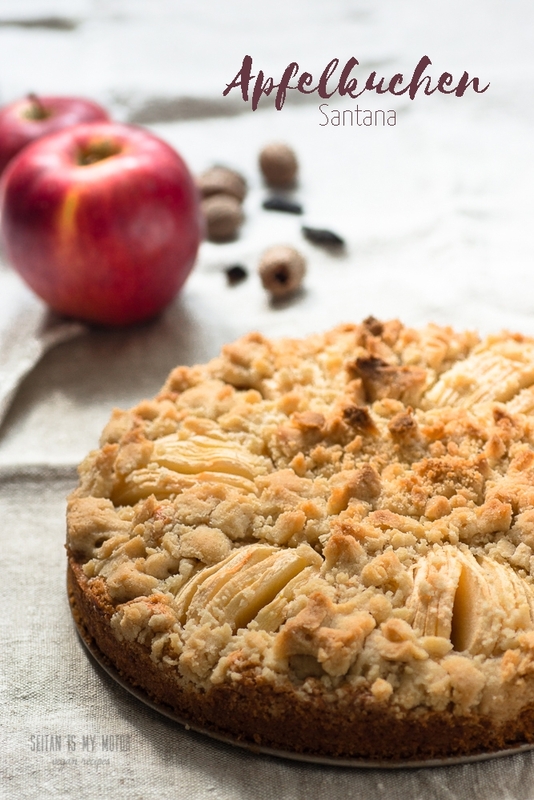 For many German apple cakes (especially the one called versunkener Apfelkuchen – sunken apple cake),the apples are cut in a certain way and I found this very hard to translate and describe. You have to quarter the apples. (They are usually peeled, but I didn’t bother for my second cake and it makes a difference. So peel them.) Then you have to cut little lines on the backs of the quarters. Those have to be deep, but not so deep your apple quarters will fall apart. Cutting the apples this way will make them fan out after baking. It looks really pretty. You can see it very well in the first picture. The only really special thing about this cake is one of its ingredients. Whenever I make something with apples I love to add a bit of nutmeg and a few scrapes of tonka bean. If you are from the US you are probably not familiar with this spice. It’s banned. And even in Europe, where you can buy it perfectly legal, it’s not commonly used. If you can find tonka beans, use them. If not just leave the spice out. The cake will turn out deliciously with cinnamon and nutmeg as well. I am quite happy I do finally have some leftovers from the second cake I made. We’re going to spend our autumn vacation packing. We’re moving soon and have to put everything in boxes starting today. Also, my daughter’s birthday is coming up. Five. She’s going to be five. And gave me exact descriptions of everything. I already impremented her birthday invitation card ideas and now all there’s left to do is a cake. Which will probably end up on the blog at some point. To make the filling, make fan shaped incisions into the apple quarters: With a small sharp knife make thin, deep lines on the back of each quarter. Set aside. Preheat the oven to 200°C and grease a 26 cm springform pan. For the cake combine flours, baking powder, sugars, and spices in a bowl and mix. Add liquid ingredients and stir until no lumps are left in the batter. Prepare the streusel topping by combining all ingredients. Knead with your hands until you can form large crumbs. Place the apple quarters on the batter (incisions up) and place the streusel on top. Bake for 40 to 45 minutes or until the cake is golden brown. Let rest for five minutes, then remove from pan and let cool completely. Na, wie schön, dass unsere (bin Holländer ;-) ) Äpfel zu solch einem wunderbaren Zweck benutzt werden. Eine Tonkabohne habe ich noch: muss also das Rezept unbedingt ausprobieren! Nebenbei möchte ich dir nochmal sagen, wie unheimlich toll deine Webseite und deinen Rezepten sind. Großen Respekt! Herzlichen Glückwunsch (nachträglich) der kleinen F.
Ja, auf jeden Fall vielen Dank für die tollen Äpfel! Und auch sonst, danke für den netten Kommentar, Hans. Mmmmmm, that looks wonderful. A perfect fall dessert! Your description of how to cut the apples reminds me of hasselback potatoes. Yes, that is eactly it! Hasselbach potatoes. Thank you!